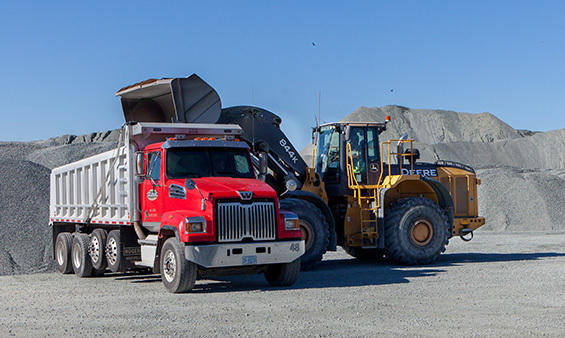 Stout Trucking delivers a variety of coarse and fine aggregates, constituting a blend of gray, tan and brown stone crushed to various sizes, in an environmentally friendly manner. The earth tone color range complements many natural settings. Some uses include driveways, walk and pathways, tar and chip applications and exposed aggregate concrete. Our specialized, multifunctional fleet of trucks can quickly load and deliver, dump and drop loads usually unassisted at any destination in Virginia and the Carolinas. The aggregates shown on our Aggregates page are always available. For convenience, pick up and speedy delivery, we stockpile our products in a spacious service yard. Open to the public, our products are easily available for small to large pick up for small business and residential needs. I am the third generation in our family to use Stout for our trucking needs. The Stouts have always handled any hauling demands we have ever needed and performed as promised. It has been a pleasure to do business with them for so many years.